Now that fall has officially arrived (with the snow we got this week which fell and promptly melted, it feels more like winter! ), I’ve been craving something that sums up fall in one bite. Some may argue that pumpkin would be the flavor of choice for such a craving – and while I love me some pumpkin, I chose apple cider, cinnamon and fresh apples for my fix. Using this fantastic muffin as a base, I switched things up and created a perfect cinnamon apple cider muffin. Sprinkled with a bit of cinnamon and sugar, the muffins are studded with bits of juicy, fresh apple and the flavors of cinnamon and apple cider shine in a big way. 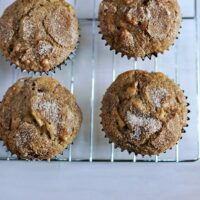 Healthy, delicious and screaming autumn, these apple cider muffins were a perfect after school snack (for the few weeks I had a kitchen in between hotel stays during our move) and one I’ll be craving all through the fall months, I’m thinking. Preheat the oven to 375 degrees F. Lightly grease a 12-cup muffin tin with cooking spray. Set aside. In a large bowl (or the bowl of an electric stand mixer), beat together the butter, yogurt and sugars until the mixture is light and fluffy. Add the eggs and beat well. In a medium bowl whisk together the flour, cinnamon, nutmeg, baking soda and salt. Add the dry ingredients to the batter. Mix until just combined. It's ok if there are a few dry spots. Mix in the applesauce. Stir in the apple cider and vanilla. Gently fold the apples into the muffin batter. Divide the batter evenly among the 12 muffin cups (fill about 1/2 to 2/3 full - use another muffin tin if you have extra batter). Sprinkle with cinnamon and sugar. Bake for 20-22 minutes or until a toothpick inserted in the center comes out clean (watch the muffins carefully since each oven may vary slightly in temperature affecting exact baking time). Let the muffins rest in the pan for about 5 minutes and then turn out onto a wire rack to cool completely. I have been searching high and low! Don’t you also have a recipe similar to this with the apples and cinnamon that you top with frosting? I swear I’ve made them before but can’t seem to find them. It has to be your recipe because if my recipes aren’t family recipes they are Mel’s recipes . Please let me know where I can find them! Thank you! The only one I can think that has chunks of apples is this one but it doesn’t have frosting?? The muffins were good and had great texture, but I didn’t taste much apple flavour except for the chunks. That’s true of every apple muffin I’ve had, though. Maybe if I reduced the cider until it was almost syrupy it would have more concentrated flavour? I happened to use homemade apple cider syrup and it worked fine. Not sure if it was more appley or not, as I haven’t tried this recipe otherwise. Syrup: boil down a gallon of cider with a stick of cinnamon until about 1/3-1/4 original volume. Add four cups of sugar, or to taste. I’ve also made it with ground cinnamon. No one but me will probably care, but I made this (with a lot of changes) and they came out to be some of the best muffins I’ve ever had. I substituted sour cream for yogurt, white for wheat flour, and for the applesauce, apple cider, and apple, I substituted it all for some very thick, homemade, chunky, sweetened, cinnamon applesauce – about 1 1/2 cups. I decreased the cinnamon to 1 tsp, and added a little water and milk to make it more muffin-consistency. Seriously fabulous muffins. I decided the applesauce’s true purpose was to be a part of these muffins. I did almost the same things! I used AP flour, milk with a little sour cream, mashed and chopped homecanned/spiced/sweetened apple slices (not apple pie filling), and apple cider syrup. No extra liquid. Used 1tsp cinn like you did. So very good. I just about made these with apple cider vinegar! I can’t wait til my baby sleeps……the lack of sleep is making me loopy. I made these today! they are delicious!!!! I made these for conference morning breakfast today. Perfect! I used Greek yogurt because that’s what I had and they came together beautifully. I think we’ll be enjoying these over and over. Thanks! I know this is an older recipe, but I just wanted to let you know my fondness for it. I baked a batch of these muffins on Sunday so I could have a healthy, cheap homemade snack/breakfast for work travel this week (I didn’t peel the apples; subbed orange juice since it’s what I had; and decreased the flour and added flax seeds). I didn’t initially love them, since I’m used to ‘packaged mix’ muffins, but my boyfriend (who rarely raves about baked goods) LOVED them. I have snacked on these muffins at the airport, and am enjoying one for breakfast, nuked in my hotel microwave. It is still moist and fluffy four days later! And it’s nice to have a tase of home when I’m alone and away from home. Thank you for the hard work you put into your blog. I am a recent follower, but I enjoy your recipes because I know they’re tested (i.e., will actually turn out like the pictures), and I enjoy your cheerful spunkiness. I made these as mini muffins today and they were great! I stuffed the batter into 24, but probably could have gotten 30 or more. Next time I’ll do that. Baked about 12-15 minutes. So good! the kids are devouring them! I just made these muffins and they are delicious! Have you ever used an egg replacement? I really want to make these or your pumpkin apple muffins but I’ve got some kids in my playgroup that are allergic to eggs.. anyone have any ideas? Thanks! my favorite thing about fall is the emergence of apple-cinnamon baked goods. these sound amazing! These look fabulous! I’m making some right now…can’t wait to taste them. I have been meaning to make those Healthy Banana Blueberry Muffins for a while but I think I am going to make these first! This just screams fall! Savannah – I’ve never frozen them but muffins like this usually freeze and reheat pretty well. These look delicious! I have a bunch of fresh apples, Im going to give this a try, thanks! How perfect would these be for snacking while Thanksgiving dinner is being cooked? I know my family would love these! These look delicious! Do you know if they freeze/ reheat well? Last weekend I came home with a ton of apples and some freshly pressed cider, and I still have lots left over! 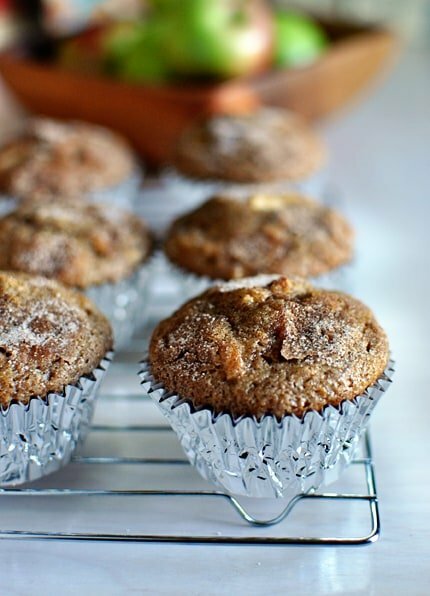 I think I’ll be making some cinnamon apple cider muffins this weekend! I made apple cider bread last year and loved it so I know I’ll love this too! Happy Friday! Melissa – generally cider is unfiltered apple juice and if it’s good quality, it has a more concentrated, deep apple flavor. If you are using a really good apple juice (like Simply Apple) you should be able to sub apple juice for the cider. Brittany – yes, I think you could use regular/Greek yogurt interchangeably. I know cider and juice are different but I can’t remember what the difference is. Do you have a recommendation on whether or not I could switch juice for cider? This is a perfect fall muffin! Would love to have these around to snack on! I always feel yogurt and whole wheat flour makes things healthy. 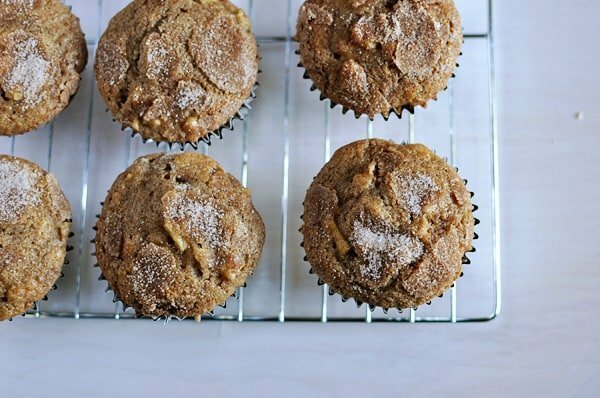 I´m loving the triple dose of apples in these muffins! I bet they freeze well too. Have a great weekend Mel! I heard that you got some snow, Mel. That’s crazy! It is still warm here, but next week the temps are supposed to be in the upper 50’s. I’m looking forward to the cool weather and plan to do some baking. I can’t wait to try these muffins…they look delicious!